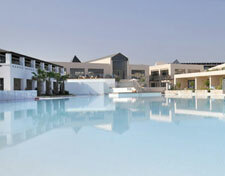 Cavo Spada Luxury Resort & Spa is located 18kms west of the picturesque city of Chania. Its location combines in a unique way the beauty and tranquility of the Cretan Archipelagos with the unsurpassed charm of the famous Old Venetian town which is only a short drive away. Positioned on the west side of the Gulf of Chania, the hotel is built on a long stretch of beach, offering magnificent views of the Gulf of Chania and of Cape Spada. The latter is a spectacular rocky cape after which our hotel was named. The hotel is spread over a 50,000 m2 private property, hence offering ample space for all the guests to enjoy their holidays in one of the 150 rooms that the hotel has to offer. The architectural design was assigned to 3SK, one of the most acclaimed and experienced architectural firms of Greece. Their portfolio includes some of the most renowned hotels of Greece. Being part of one of the oldest and most respected hotel companies of Chania, Cavo Spada Luxury Resort & Spa is the epitome of our experience in providing holidays of unprecedented quality and comfort. Opening in Spring 2008 Cavo Spada Luxury Resort & Spa eagerly awaits you to introduce you to the genuine Cretan hospitality and atmosphere.